Baltimore 10 Miler Recap: The Goal? Run Fast. I’d always heard about the Baltimore 10 Miler. I knew small parts of the course from the Celtic Solstice 5 Miler. But everyone talks about how hilly this course is, about how the hills will be brutal. I had signed up for the Baltimore 10 Miler with the full intention of racing, to test out where I am with speed and to decide if I am capable of getting fast enough to try for another BQ this fall. Well before the Bmore10 I went ahead and registered for the marathon (Leigh Valley Via Marathon) so that just left the goal of testing out my speed. Six weeks post-Boston, how fast could I run? The weekend prior I ran as a pacer for the 1:50 runners at the Zooma Annapolis Half Marathon, a race I’ve done several times as a pacer (hands down a really rewarding way to run, but that’s for another post). The Zooma course was HILLY and HOT. Blazing hot. Humid. And stupid hilly. In fact, there were more hills in this year’s course than I recall from previous years. So I figured it was all good training for the Baltimore 10 Miler. The week of the race I realized they had pace groups and rather arbitrarily I decided to see if I could hang with the 1:15 group. For some reason I didn’t check the pace on that finish time and by the time I met the pacers at the start line I was figuring it was around 7:45. They kindly assured me they’d be running even 7:30 splits. Oh. Ok. 7:30s it is. The pacers were Alex, Amy and Jacelyn. Alex told me I could run ahead of them for a while if I want and then they’d catch up. Ha! I was just hoping I could hang with them. He warned me that it would be a fast downhill start and the end would be back up that same hill. Noted. And indeed the first three miles were fast, though right around 7:30. And I did indeed cruise just ahead, but within earshot, of the 1:15 pace group for the first 6 or so miles. By mile 8 we were all caught up and they were inching ahead. I also had paid attention to other veterans of this race when they said to keep some in the tank for the last two miles. I desperately wanted to stay side-by-side with the pacers but I was still on track to hit 1:15 and really wasn’t sure how the last uphill stretch would be. It wasn’t easy. My pace slipped to a little over 8:00 and it was all mental to try and stay sub-8. If we’d not already covered 9 miles the last gradual uphill mile might not have seemed so unforgiving. Much like Heartbreak Hill. Fortunately the finish itself, the last .2 perhaps, was nice and flat and the finish arch was visible. (I hate when you can’t actually see the finish line). The 1:15 pacers were cruising in front of me. I felt like I might throw up and/or that my legs might give out. Instead, I found my final kick and had a strong finish. I crossed at 1:15:20. Mission accomplished. This was one of my faster distance races and gave me the confidence to plow straight ahead with speedwork and marathon training this summer. Game on! 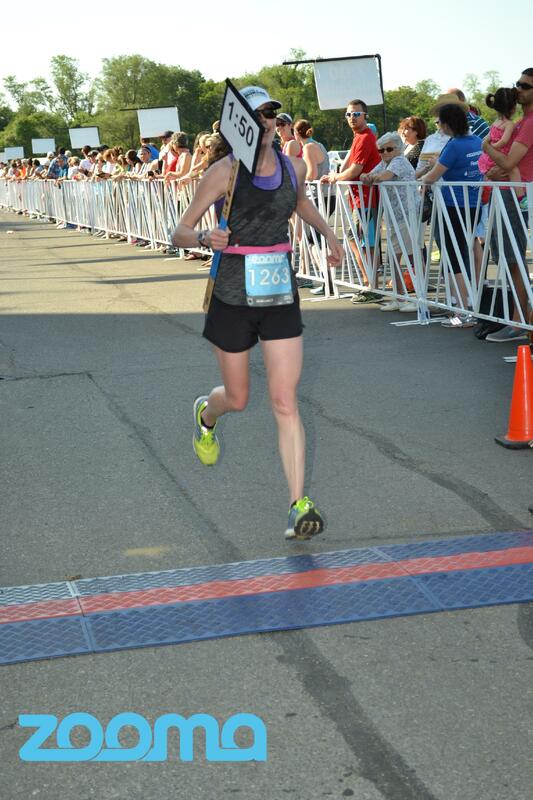 This entry was posted in Running and tagged 10-miler, bq, half marathon, Marathon, Training, ZOOMA on June 8, 2015 by Natalie.